Tobi Adebayo-Rowling has left Posh and joined Sligo Rovers. Striker Tom Nichols moved to Posh from League Two side Exeter for an undisclosed fee, while forward Luke James and full-backs Lawrie Wilson and Tobi Adebayo-Rowling left the club. Luke James has returned on loan to his former club Hartlepool until the end of the season after a similar move to Bradford City was ended early. Wilson’s month-long loan spell has ended and he has returned to parent club Bolton, while Adebayo Rowling has joined former Posh boss Dave Robertson at Irish League side Sligo Rovers after his contract at the ABAX Stadium was cancelled by mnutual consent. Adebayo-Rowling. 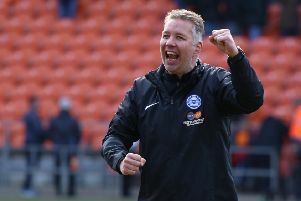 a product of the Posh Academy, played five first-team matches for Posh when Robertson was still manager at the ABAX Stadium in August. James (21) failed to score for Bradford. He only scored twice in 34 appearances for Posh following a £500k move from Hartlepool in September, 2014. James came through the ranks at Hartlepool, having joined the club’s Academy at the age of 11 and his performances in the Youth Team and Reserves won him a professional contract when he turned 17. The pacey forward scored 22 goals in 100 appearances during his first spell with the Club, earning the Fans’ and Players’ Player of the Year awards in 2013/14 after hitting the net 16 times. Suggestions that attacking midfielder Marcus Maddison would leave Posh and that central defender Jack Baldwin could join Premier League side Bournemouth proved wide of the mark as did the belief that Stevenage midfielder Dean Parrett would move to Posh. A move to bring legendary goalkeeper Mark Tyler back to Posh from Luton fell through at the last minute.